Editor: the FileMaker Rich-Text Editor Addon from Geist Interactive on Vimeo. 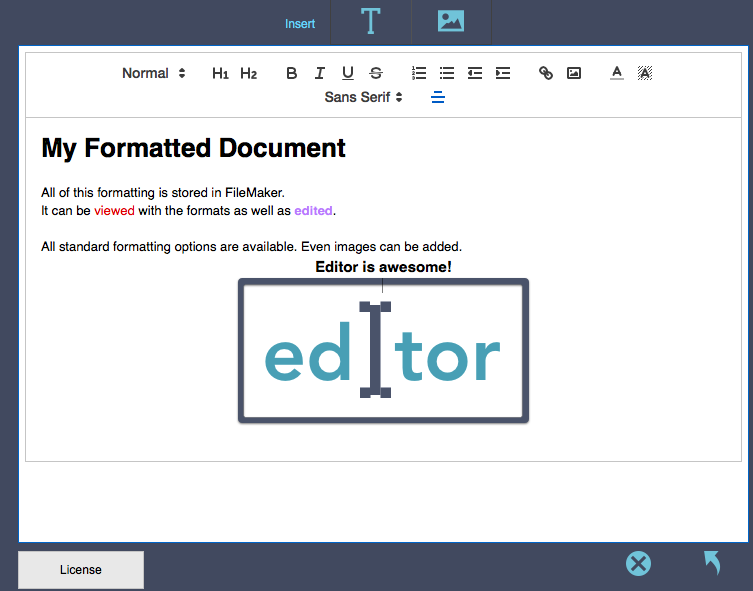 Editor is a fully-functional rich-text editor for FileMaker, It is all native FileMaker, and gives users many options for formatting text and flexibility to the developer of a custom app. Users can write text in FileMaker using a wide variety of formatting tools. The user can add links, images as well. And all of the formatting information is stored inside FileMaker and can be retrieved for editing. The FileMaker developer has complete freedom over the theme that is used, the toolbar options, custom buttons, and even the formatting that can be pasted into the document. Using FileMaker scripts and buttons, a developer can add additional functionality. The possibilities are great. Check out the Customization page for further details.